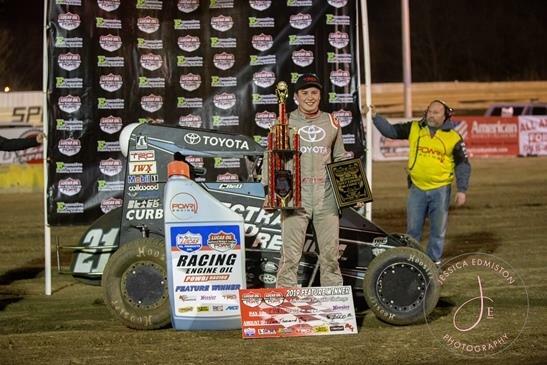 MARION, Ill. (October 20, 2018) - Christopher Bell took the lead on lap 13 and led the final 28 circuits to earn his 50th career national midget feature victory at the POWRi Lucas Oil National Midget League's Southern Illinois Shootout at the Southern Illinois Raceway in Marion. All 50 of Bell's victories have come with Toyota. The 2017 NASCAR Camping World Truck Series champion has six midget feature wins this season, including his second consecutive Chili Bowl Nationals title. The victory is the 37th national midget feature win for a Toyota-powered driver in 2018. Zach Daum started from the pole and immediately moved out to the lead with Logan Seavey sliding into second. Daum's lead would be short-lived, though, after being caught in a lap four incident that would drop him to the tail end of the field, with Seavey assuming the lead and Bell quickly moving into second after starting from the eight spot. Three additional yellow flags would slow the action down through lap 11 as Seavey continued to lead Bell, followed by Alex Bright and Jonathan Beason. Seavey maintained his lead on the lap 12 re-start, but Bell stayed right with him and then made his move for the lead on lap 13. As the race passed the midway point, the lead duo eventually pulled away to make it a two-car race. Bell would maintain the top spot, but Seavey stayed right with him. A late yellow would create a seven-lap dash to the finish, but Bell simply checked out on the restart, opening up a comfortable lead on the way to his milestone 50th win. Seavey would finish second to make it a Toyota one-two finish for the second consecutive night. They were joined in the top 10 by teammates Tanner Carrick in sixth and Holly Shelton in tenth. For further information, visit www.powri.com, "Like" POWRi on Facebook and follow @POWRi_Racing on Twitter. Wheatland, MO (September 22, 2018) - Outlasting a historic 78-car field, Kyle Cummins dominated Saturday's Jesse Hockett/Daniel McMillin Memorial main event to extend his POWRi Lucas Oil WAR Sprints League record to three career victories. After earning LRB, Inc. #HighPointMan honors in preliminary action, the Princeton, Indiana native followed that up with a win in the RAMS Racing Pole Shuffle and then a wire-to-wire triumph as he led all 30 feature laps. The victory means that if Cummins can park his EZR No. 3C in victory lane at Fairbury American Legion Speedway on October 6th, then he will sweep the Bell Racing USA Triple Crown Challenge and take home a $20,000 payday. With combined points from the split preliminary fields lining up Saturday's action, all that was on tap for the Hockett/McMillin Memorial finale was two C-Mains, a pole shuffle, two B-Mains, and the 30-lap main event. Jack Wagner kicked things off with a win in Hinchman Racewear C-Main one and transferred on with Mitchell Davis, Brad Ryan and Ben Brown. Jack's younger brother, Samuel Wagner, won the second Bell Racing USA C-Main and transferred with Joe B. Miller, Chase Porter and Vinny Ward. In the RAMS Racing Pole Shuffle, Colten Cottle of Kansas, Illinois was the show early on, as he electrified the crowd by winning three straight rounds. In the end, Kyle Cummins topped Landon Simon, Riley Kreisel and Wyatt Burks to secure the pole position of the 30-lap main event. Moving onto B-Main action, the first Schure Built Suspension B-Main saw Tyler Thomas take the win and transfer to the main event with Mitchell Davis, Brandon Mattox, Korey Weyant, Andrew Deal and Chris Parkinson. In Wilwood Disc Brakes B-Main two, it was Zach Daum winning and transferring with Thomas Meseraull, Danny Smith, Chad Goff, Clinton Boyles and Wesley Smith. The story from the B-Mains was quite simply Mitchell Davis, who entered the night 73rd in points and ensued to go 15th-to-2nd in the C and 17th-to-2nd in the B as he ran the alphabet soup and qualified for the main event. Firing off the POWRi Lucas Oil WAR Sprints League main event in front of a packed house at Lucas Oil Speedway, it was Kyle Cummins taking the early lead over Landon Simon, Colten Cottle, Wyatt Burks and Riley Kriesel. A red flag on lap six for ninth-place running Matt Moore would bring the field to a halt as the No. 9 went wildly flipping down the front stretch. Moore quickly climbed out of the car under his own power. As Cummins pulled away on the ensuing restart, a fierce battle for the second spot developed between Simon, Kreisel Cottle and Burks. As the cross flags waved at the halfway mark, all eyes were locked on Simon and Kreisel, who were engaged in a full on WAR for the runner-up position. That battle would soon end, however, as the turn two cushion bit Kreisel and sent his No. 90 on the bike. The young Warsaw, Missouri native miraculously set the car back down and saved a near-disastrous crash, but could not prevent it from sliding into the wall and coming to a stop to bring out the caution. Coming to the final restart with 14 laps left, Simon bolted to the top and presented a challenge for the lead momentarily as Cummins remained committed to the bottom. Cummins would slowly extend his lead as Cottle and Burks both snuck past Simon to move into podium positions with ten to go. With five laps remaining, it looked as if Cottle was cutting into the lead, but he nor the other 26 starters could stop Kyle Cummins on this night. Cummins, of Princeton, Indiana, led all 30 laps to score the Jesse Hockett/Daniel McMillin Memorial championship in dominating fashion. 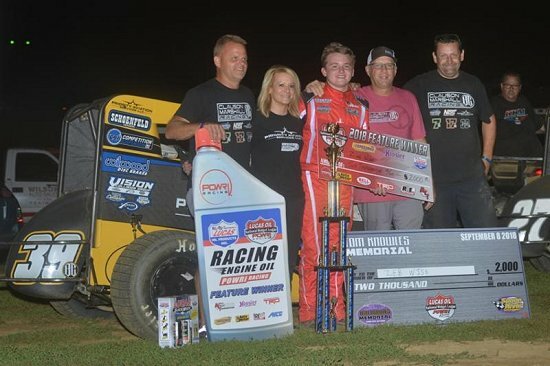 Marking his fourth night of competition with the POWRi Lucas Oil WAR Sprints League, it was the third time Cummins has visited victory lane with the league. 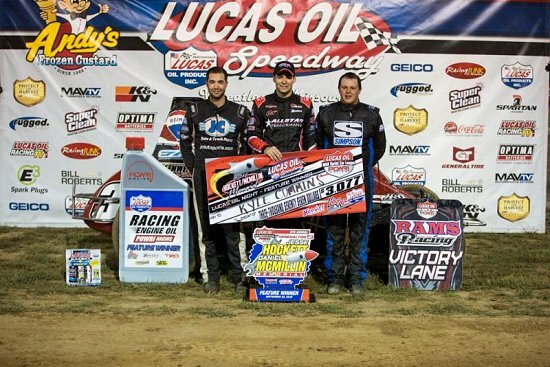 His win at Lucas Oil Speedway was preceded by a victory at Lake Ozark Speedway in August, and means that a triumph at Fairbury American Legion Speedway on October 6th would give Cummins a clean sweep of the Bell Racing USA Triple Crown Challenge and send him home with a whopping $20,000 payday! Following Cummins to the finish line in the Hockett/McMillin Memorial finale was Wyatt Burks with a second-place finish in his No. 11W entry. Colten Cottle backed up his impressive pole shuffle run with a podium result of third for his No. 5C machine in the main event. Landon Simon of Brownsburg, Indiana brought his Mount Baker Vapor No. 24 home in the fourth spot, while Anthony Nicholson of Tennessee rounded out the top five. Closing out the top ten on Saturday night was Chris Phillips in sixth, Brandon Mattox in seventh, Thomas Meseraull in eighth, Clinton Boyles in ninth, and Zach Daum in tenth. The POWRi Lucas Oil WAR Sprints League will take next weekend off before reconvening on Friday and Saturday, October 5th and 6th, at Fairbury American Legion Speedway in Fairbury, Illinois for "Sprint Mania." The event will mark the conclusion to the 2018 season as we crown the league champion at FALS. It is a co-sanctioned event along with the POWRi Lucas Oil WAR Wildcard Sprints League. 1. 77-Jack Wagner (7); 2. 56-Mitchell Davis (15); 3. 13-Brad Ryan (2); 4. 49B-Ben Brown (13); 5. 6M-Christian Moore (4); 6. 41-Brad Wyatt (10); 7. 51-Mitchell Moore (5); 8. 2H-Luke Howard (3); 9. 48-Craig Oakes (16); 10. 13-Grant Wresche (9); 11. 36-Kevin Reed (6); 12. 7R-JD Black (14); 13. 101-Chuck McGillivray (1); 14. 67-Jonathan Hughes (8); 15. 99B-Bailey Elliott (11); 16. 4-Braydon Cromwell (12); 17. 4F-Chad Frewaldt (DNS). 1. 73-Samuel Wagner (3); 2. 31-Joe B. Miller (14); 3. 22P-Chase Porter (8); 4. 82-Vinny Ward (5); 5. 73S-Lane Stone (4); 6. 54A-Keith Bolton (12); 7. 82C-Christie Thomason (10); 8. 52-JD Fry (9); 9. 22X-Mike Mueller (2); 10. 27S-Tom Sires (7); 11. 75-Broc Elliott (17); 12. 97-Kevin Cummings (15); 13. 11-Frank Rogers (11); 14. 21C-Chris Desselle (6); 15. 20G-Noah Gass (1); 16. 36E-Blake Edwards (13); 17. 21X-Carson Short (16). Round 1: 1. 5C-Colten Cottle; 2. 6-Mario Clouser; 3. 6X-Chris Phillips; 4. Ty Hulsey. Round 2: 1. 5C-Colten Cottle; 2. 90-Riley Kreisel; 3. 6-Mario Clouser; 4. Matt Moore (DNS). Round 3: 1. 5C-Colten Cottle; 2. 90-Riley Kreisel; 3. 18-Terry Richards; 4. 16-Anthony Nicholson. Round 4: 1. 24-Landon Simon; 2. 90-Riley Kreisel; 3. 5C-Colten Cottle; 4. 9$-Kyle Clark (DNS). Round 5: 1. 3C-Kyle Cummins; 2. 24-Landon Simon; 3. 90-Riley Kreisel; 4. 11W-Wyatt Burks. 1. 91-Tyler Thomas (1); 2. 56-Mitchell Davis (18); 3. 28-Brandon Mattox (13); 4. 99-Korey Weyant (6); 5. 15D-Andrew Deal (4); 6. 65-Chris Parkinson (2); 7. 7M-Chance Morton (14); 8. 22S-Slater Helt (3); 9. 54-Trey Gropp (16); 10. 77-Jack Wagner (17); 11. 21-Ryan Kitchen (10); 12. 37-Brian Beebe (8); 13. 24C-Craig Carroll (9); 14. 30-Ryan Kent (12); 15. 13-Brad Ryan (19); 16. 65B-Quinton Benson (5); 17. 77K-Katlynn Leer (7); 18. 49-Ben Brown (20); 19. 20-Steve Thomas (15); 20. 1-Mitch Wissmiller (DNS). 1. 3C-Kyle Cummins (1); 2. 11W-Wyatt Burks (4); 3. 5C-Colten Cottle (5); 4. 24-Landon Simon (2); 5. 16-Anthony Nicholson (8); 6. 6X-Chris Phillips (11); 7. 28-Brandon Mattox (17); 8. 00-Thomas Meseraull (16); 9. 94L-Clinton Boyles (22); 10. 5D-Zach Daum (14); 11. 6-Mario Clouser (9); 12. 15D-Andrew Deal (21); 13. 24H-Ty Hulsey (12); 14. 91-Tyler Thomas (13); 15. 18-Terry Richards (7); 16. 9X-Chad Goff (20); 17. 1W-Paul White (27); 18. 65-Chris Parkinson (23); 19. 12-Wesley Smith (24); 20. 90-Riley Kreisel (3); 21. 22S-Slater Helt (26); 22. 56-Mitchell Davis (15); 23. 9-Matt Moore (10); 24. 99-Korey Weyant (19); 25. 5$-Danny Smith (18); 26. 9$-Kyle Clark (6); 27. 65B-Quinton Benson (25). Lap Leader(s): Kyle Cummins 1-25. Hard Charger(s): Clinton Boyles +13. Wheatland, MO (September 21, 2018) - The fans in attendance at Lucas Oil Speedway on Friday night were treated to a thrilling show as the Jesse Hockett/Daniel McMillin Memorial continued on with the Rockwell Security qualifying night. Another field of 39 POWRi Lucas Oil WAR Sprints League competitors signed-in for action, giving us a new event record of 78 total entries this weekend. At the conclusion of Friday's show, another new winner rose to the top as Anthony Nicholson of Millingston, Tennessee outlasted a fleet of challengers in the green-to-checkered 25-lapper to score the preliminary triumph at the 'Diamond of the Dirt Tracks." Opening the night with another four-set series of group qualifying hot laps, quicktime honors were taken by Kyle Cummins (16.053), Anthony Nicholson (15.771), Danny Smith (16.055) and Colten Cottle (15.358) as the Rockwell Security qualifying night fired off. In heat race action, Hinchman Racewear heat one was taken by Kyle Cummins, Bell Racing USA heat two was won by Chad Goff, Schure Built Suspension heat three was claimed by Wyatt Burks and Wilwood Disc Brakes heat four went to Mitch Wissmiller. A trio of ten-lap qualifiers was next, which saw Riley Kreisel score High Side Design qualifier one, Quinton Benson take Indy Race Parts qualifier two and Matt Moore steal Chalk Racing Stix qualifier three. With another eight-car inversion mixing up the feature field, it was Anthony Nicholson and Mitch Wissmiller leading us to the green flag. However, neither would command the opening circuit, as third-starter Matt Moore methodically hit the bottom and snuck by both to lead the first lap. Lead change after lead change would follow as Nicholson took the lead on lap two, before Wissmiller held the point on the third circuit. Wissmiller finally grabbed a firm command of the top spot as he started to sneak away, blasting the top of the 3/8th-mile surface in his No. 1 entry. While Wissmiller maintained the lead, Wyatt Burks snuck into the second spot from fifth and Riley Kreisel and Kyle Cummins were hustling into the top five. As Wissmiller remained committed to the cushion, Burks approached him by rolling the bottom and overtook him for the lead on the tenth circuit. While a new leader emerged, a hectic battle ensued for the runner-up spot as Wissmiller, Nicholson, Kreisel, Cummins and Moore were practically competing under a blanket. Taking over second just past halfway, Kreisel looked to be the firm challenger for Burks' lead, but a mistake on the cushion sent Kreisel fading and moved Nicholson up to P2 with ten to go. Reeling in Burks lap-after-lap, Nicholson re-appeared after falling to fourth and was there to contend in the late running. As Burks slipped off the bottom of turns one and two, Nicholson capitalized and drove by him to reclaim the top spot on the 20th circuit. From there, Nicholson went unchallenged en route to a victory. 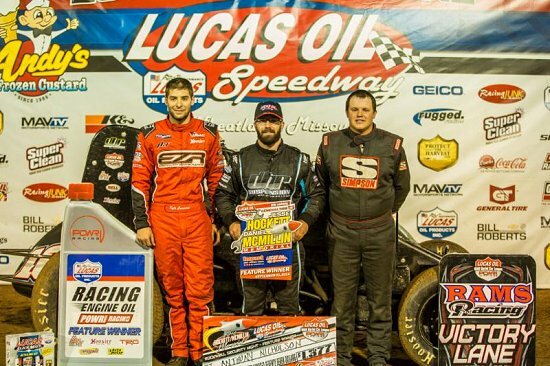 The Friday night triumph marked the first of Nicholson's POWRi Lucas Oil WAR Sprints League career. It was an emotional win for the Tennessee native, who admittedly had a troubling 2018 season, prior to this huge breakthrough on a big stage. Nicholson's victory also made it 19 different winners in 26 WAR races this season, with 11 of those being first-time winners. Following Nicholson to the line on Friday night was Wyatt Burks in the second spot after leading ten laps around the midway point. Entering the feature as the LRB, Inc. #HighPointMan, Kyle Cummins continued his stellar night and grabbed an eighth-to-third charge in the feature. Making a last-lap pass to take the fourth position, Oklahoma's Matt Moore continued his streak of never finishing outside the top five with WAR, as tonight marked his third race with the league. 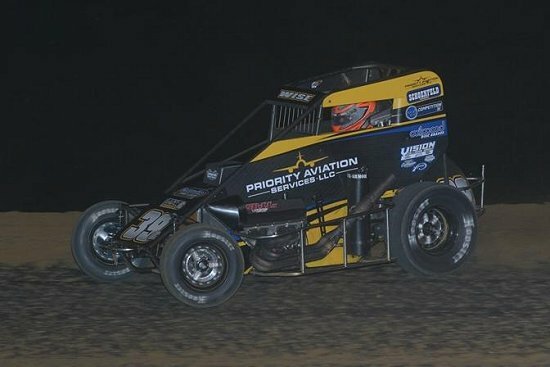 Falling to fifth after a nearly-disastrous last-lap encounter with lap traffic, Warsaw, Missouri's Riley Kreisel hung on to round out the top five in his No. 90. Closing out the top ten was Colten Cottle in sixth, Danny Smith in seventh, Zach Daum in eighth, Andrew Deal in ninth and Quinton Benson in tenth. With both preliminary nights now complete, all that remains for the 2018 Jesse Hockett/Daniel McMillin Memorial is the Saturday night championship finale. With the new format, Saturday's program includes two C-Mains, two B-Mains, a pole shuffle and the final main event, to decide this year's champion. 1. 3C-Kyle Cummins (16.053); 2. 7M-Chance Morton (16.345); 3. 7S-Wade Seiler (16.384); 4. 90-Riley Kreisel (16.392); 5. 31-Joe B. Miller (16.453); 6. 15D-Andrew Deal (16.575); 7. 54-Trey Gropp (16.805); 8. 73-Samuel Wagner (16.956); 9. 48-Craig Oakes (17.074); 10. 75-Broc Elliott (DNQ). 1. 16-Anthony Nicholson (15.771); 2. 5D-Zach Daum (16.110); 3. 9X-Chad Goff (16.118); 4. 22-David Stephenson (16.240); 5. 73S-Lane Stone (17.005); 6. 101-Chuck McGillivray (17.033); 7. 65B-Quinton Benson (17.342); 8. 13-Grant Wresche (17.365); 9. 22X-Mike Mueller (17.643); 10. 54A-Keith Bolton (17.859). 1. 5$-Danny Smith (16.055); 2. 9-Matt Moore (16.134); 3. 7JR-Warren Johnson (16.295); 4. 11W-Wyatt Burks (16.361); 5. 51-Mitchell Moore (16.396); 6. 49B-Ben Brown (16.769); 7. 6M-Christian Moore (16.948); 8. 97-Kevin Cummings (17.039); 9. 22P-Chase Porter (17.083); 10. 36E-Blake Edwards (DNQ). 1. 5C-Colten Cottle (15.358); 2. 1-Mitch Wissmiller (15.504); 3. 1W-Paul White (16.053); 4. 24C-Craig Carroll (16.094); 5. 2-Zach Clark (16.250); 6. 37-Brian Beebe (16.406); 7. 52-JD Fry (16.414); 8. 99E-Bailey Elliott (16.528); 9. 21C-Chris Desselle (16.777). 1. 3C-Kyle Cummins (4); 2. 90-Riley Kreisel (1); 3. 7M-Chance Morton (3); 4. 31M-Joe B. Miller (5); 5. 15D-Andrew Deal (6); 6. 7S-Wade Seiler (2); 7. 54-Trey Gropp (7); 8. 73-Samuel Wagner (8); 9. 48-Craig Oakes (9); 10. 75-Broc Elliott (10)-DNS. 1. 9X-Chad Goff (2); 2. 16-Anthony Nicholson (4); 3. 5D-Zach Daum (3); 4. 22-David Stephenson (1); 5. 65B-Quinton Benson (7); 6. 101-Chuck McGillivray (6); 7. 73S-Lane Stone (5); 8. 13W-Grant Wresche (8); 9. 22X-Mike Mueller (9); 10. 59D-Keith Bolton (10). 1. 11W-Wyatt Burks (1); 2. 7JR-Warren Johnson (2); 3. 9-Matt Moore (3); 4. 5$-Danny Smith (4); 5. 36E-Blake Edwards (10); 6. 97-Kevin Cummings (8); 7. 51-Mitchell Moore (5); 8. 22P-Chase Porter (9); 9. 6M-Christian Moore (7); 10. 49B-Ben Brown (6). 1. 1-Mitch Wissmiller (3); 2. 5C-Colten Cottle (4); 3. 1W-Paul White (2); 4. 37-Brian Beebe (6); 5. 2-Zach Clark (5); 6. 24C-Craig Carroll (1); 7. 99E-Bailey Elliott (8); 8. 21C-Chris Desselle (9); 9. 52-JD Fry (7). 1. 90-Riley Kreisel (4); 2. 22-David Stephenson (1); 3. 3C-Kyle Cummins (6); 4. 15D-Andrew Deal (7); 5. 16-Anthony Nicholson (5); 6. 1W-Paul White (2); 7. 22X-Mike Mueller (12); 8. 7M-Chance Morton (3); 9. 7S-Wade Seiler (8); 10. 51-Mitchell Moore (10); 11. 13-Grant Wresche (11); 12. 54A-Keith Bolton (13); 13. 99B-Bailey Elliott (9). 1. 65B-Quinton Benson (1); 2. 11W-Wyatt Burks (5); 3. 37-Brian Beebe (2); 4. 1-Mitch Wissmiller (5); 5. 5D-Zach Daum (3); 6. 54-Trey Gropp (9); 7. 101-Chuck McGillivray (8); 8. 7JR-Warren Johnson (4); 9. 6M-Christian Moore (12); 10. 21C-Chris Desselle (11); 11. 22P-Chase Porter (10); 12. 97-Kevin Cummins (7); 13. 49-Ben Brown (DNS). 1. 9-Matt Moore (3); 2. 5C-Colten Cottle (5); 3. 9X-Chad Goff (6); 4. 5$-Danny Smith (1); 5. 36E-Blake Edwards (4); 6. 2-Zach Clark (7); 7. 24C-Craig Carroll (8); 8. 73-Samuel Wagner (10); 9. 73S-Lane Stone (9); 10. 48-Craig Oakes (11); 11. 52-JD Fry (12); 12. 31-Joe B. Miller (2); 13. 75-Broc Elliott (DNS). 1. 1W-Paul White (1); 2. 7M-Chance Morton (3); 3. 24C-Craig Carroll (4); 4. 51-Mitchell Moore (8); 5. 73-Samuel Wagner (6); 6. 6M-Christian Moore (7); 7. 59D-Keith Bolton (12); 8. 13W-Grant Wresche (11); 9. 22X-Mike Mueller (5); 10. 52-JD Fry (10); 11. 36E-Blake Edwards (2); 12. 97-Kevin Cummings (9); 13. 75-Broc Elliott (13)-DNS. 1. 7JR-Warren Johnson (1); 2. 7S-Wade Seiler (5); 3. 2-Zack Clark (2); 4. 54-Trey Gropp (3); 5. 101-Chuck McGillivray (4); 6. 21C-Chris Desselle (8); 7. 73S-Lane Stone (6); 8. 22P-Chase Porter (10); 9. 49B-Ben Brown (12); 10. 99E-Bailey Elliott (11); 11. 31M-Joe B. Miller (7)-DNS; 12. 48-Craig Oakes (9)-DNS. 1. 16-Anthony Nicholson (1); 2. 11W-Wyatt Burks (5); 3. 3C-Kyle Cummins (8); 4. 9-Matt Moore (3); 5. 90-Riley Kreisel (6); 6. 5C-Colten Cottle (7); 7. 5$-Danny Smith (12); 8. 5D-Zach Daum (14); 9. 15D-Andrew Deal (13); 10. 65B-Quinton Benson (10); 11. 9X-Chad Goff (4); 12. 7S-Wade Seiler (18); 13. 37-Brian Beebe (11); 14. 24C-Craig Carroll (19); 15. 2-Zach Clark (20); 16. 1W-Paul White (15); 17. 7JR-Warren Johnson (16); 18. 7M-Chance Morton (17); 19. 22-David Stephenson (9); 20. 1-Mitch Wissmiller (2). Lap Leader(s): Moore 1, Nicholson 2, Wissmiller 3-9, Burks 10-19, Nicholson 20-25. Lewistown, IL - Zeb Wise of Angola, Indiana picked up his first career POWRi Lucas Oil National Midget League Saturday night at Spoon River Speedway. Wise used a unique line on the high-banked 3/8 mile Spoon River Speedway to etch his name in the history books as the winner of the 32nd annual Tom Knowles Memorial. Starting inside row three, Wise charged to the front battling through a field of heavy hitters including last night's winner at Jacksonville Speedway in the Herb Barlow Memorial, Logan Seavey. Coming to green, Zach Daum and current POWRi Lucas Oil National Midget League point leader Tucker Klaasmeyer shared the front row. Leading the opening lap, Daum jumped into the lead over Tucker Klaasmeyer and Tanner Carrick. After Carrick overtook Klaasmeyer for second and Daum for the lead, Wise continued to move forward ripping the top side mirroring Carrick's line, while Daum rolled the bottom. As Carrick caught lap traffic, Daum and Wise closed, and a blanket could be thrown over the top three. In a split second decision, Wise found some magic in the middle in turns one and two, allowing him to surge into the lead. While Daum worked the bottom, a line he has used to win many races, including some Knowles Memorials of the past, Wise used his line to stay out front while bringing along Klaasmeyer to second. Coming to the line, Wise led Klaasmeyer, with Carrick in third. Klaasmeyer's second was another good point night as the POWRi Lucas Oil National Midgets have a handful of races left for 2018. Pole sitter Zach Daum took fourth with Tyler Barron in fifth. Ryan Robinson finished sixth with Sam Johnson in seventh. 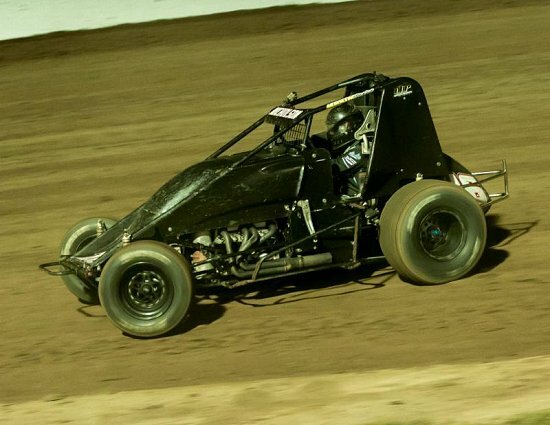 Leading POWRi Lucas Oil National Midget League Rookie of the Year candidate Karter Sarff took eighth, with Logan Seavey and Blake Carrick completing the top ten. 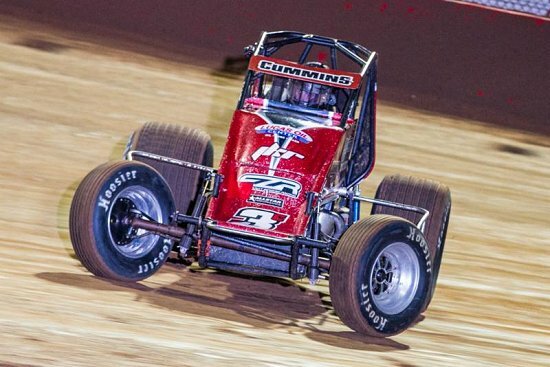 "When I went and split Carrick there, I found the middle in one and two and had a lot of grip coming off, so I used that to help me into turn three," said Zeb Wise. "I can't thank Tim, my dad, and Kevin enough. It was just those three this weekend, so tough week for them, but we got one done for them. I was just waiting for someone to show their nose on the bottom before moving down there. I got the lead up top in three and four. I felt like I had a pretty good car up there so I stayed and got it done." "Zeb did a really good job," commented Tucker Klaasmeyer. "He found the top there early. It was a really fun race. Everyone got to look around a little bit. It would have been more fun if it was a 50-lapper. It was just a good time and a good race. We had a good car. I felt like we could have gone anywhere if the track would have changed. It was a good point night and everything is rolling in the trailer. Jay and a lot of guys on this team have experience winning championships, so they can teach me a lot. Just being smooth and making sure to finish all the races is what counts." "When you lead that many laps, you're kind of just a sitting duck out front," stated Tanner Carrick. "I saw them on the bottom and moved to the bottom. Led a couple laps on the bottom and then decided to go back up top and drove it off the track, and fell back to fourth or fifth and then drove back up to third. Other than that, it felt pretty good. Just a sitting duck out front, I guess."